Who can forget the first time Darth Vader marched onto Princess Leia's ship, in his black cape and mask? Or the white hard-body suit of the stormtroopers? Or Leia's outfit as Jabba's slave? These costumes-like so many that adorned the characters of that galaxy far, far away-have become iconic. For the first time, the Lucasfilm Archives is granting full access to the original costumes of episodes IV, V, and VI, allowing them to be revealed in never-before-seen detail. In over 200 new costume photographs, sketches, and behind-the-scenes photos and notes, based on new interviews, fans will get a fresh perspective on the creation of the clothes and costume props that brought these much-loved characters to life. 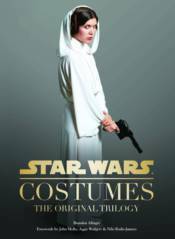 Star Wars Costumes: The Original Trilogy affords both new and longtime Star Wars fans an intimate look at the unforgettable costumes from this classic series.